A Demo App is preloaded onto all devices that support SimulScan and is intended to quickly demonstrate how SimulScan works and what it can do. The Demo App also provides a means of testing custom Templates that implement Multi-barcode, signature capture, OCR, OMR and other advanced SimulScan features. Note: The Demo App cannot save acquired data and is not suitable for production environments. 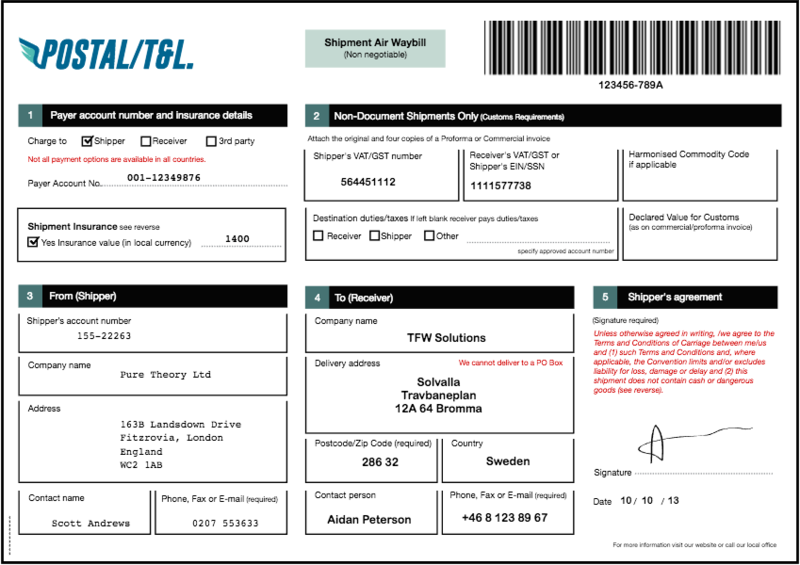 Download the Transport & Logistics (T&L) Demo Form (shown above) and print it. Locate and tap the SimulScan Demo App icon on the scanning device (see numbered images, below). Select the "Postal, Transport & Logistics" Template. Tap "Start SimulScan" and begin scanning. The data acquisition device (camera or imager) is selected automatically by SimulScan based on type of data to be acquired and/or settings defined in the Template (this demo uses the camera). The screen should look like image 6, below. Hold the scanner still when the green frame appears. Upon acquisition, parsed data is displayed as in Image 8. See the Advanced Settings section for access to auto-capture and sensitivity settings. Verify that acquired data is correct, scrolling as necessary. If SimulScan has less than absolute confidence in the correctness of a decoded value, that value will be presented along with an image of the corresponding area from the scanned Document to aid in validation or correction. Tap red-highlighted fields to confirm or correct the captured data. The keyboard appears; correct as needed. Press OK to return to the Parsed Data screen. 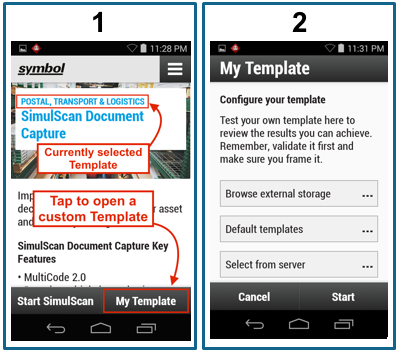 The SimulScan Demo app exposes all SimulScan features (except the ability to save data), and can be used to test Templates built by an organization. Custom Templates stored on the Template Builder web site can be pulled from within the Demo app. Locally stored Templates must be pushed to the device manually. Create a printed version of the target Document(s) for which the Template(s) were created. For more, see Deploy Templates. 1. Open SimulScan and press Start. A screen appears similar to Image 1, below. Notice that the most recently used Template (if any) remains selected (shown is the "Postal, Transport & Logistics" Template from the exercise above). To switch Templates, press the "My Template" button. A screen appears similar to Image 2. 2. Tap the appropriate drop-down to open the Template to be tested, as in Image 2. To continue, go to Step 4 of the How to Use the Demo App section, above. Browse external storage - lists Templates in the /<internal storage>/simulscan/templates/ folder on the device. Default templates - lists Templates included with SimulScan, which are stored in the /enterprise/device/settings/datawedge/templates folder on the device. Custom Templates pushed to this location will be displayed with included ones. Select from server - lists Templates in the /<accountID>/templates/release/ folder on the Template Builder web site (log-in required) and copies the selected Template to the /<internal storage>/simulscan/templates/ folder on the device. Advanced Settings allow the device user to make adjustments before scanning to help optimize data acquisition. For example, capturing a specific portion of a borderless Document, disabling Auto Capture will prevent capture until the desired portion of the Document is lined up. As another example, increasing Capture Sensitivity can reduce blurriness of the acquired images for Documents that are heavily populated with barcores or other data objects. **Note: The Advanced Settings panel is accessible only when SimulScan is actively scanning. 1. Tap "Start SimulScan" to enter scanning mode. 2. Tap on the "hamburger menu" to invoke the Advanced Settings panel. 3. 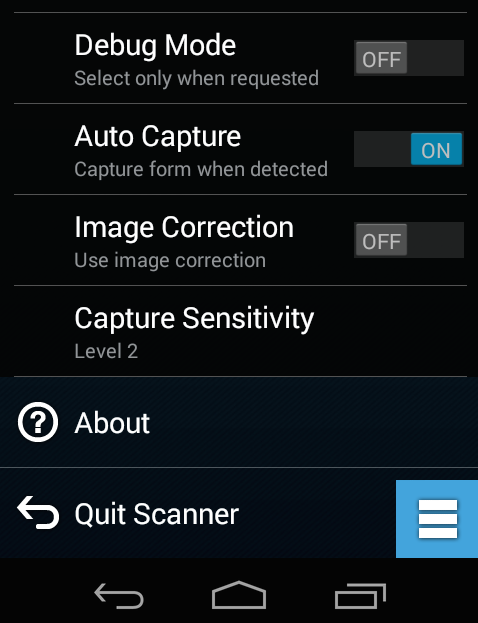 Tap on a feature to change its setting as defined below: SimulScan's Advanced Settings panel. Identification Timeout - sets the number of seconds (from 5-30) SimulScan will attempt to identify a Document described by the selected Template. Processing Timeout - sets the number of seconds (from 5-30) SimulScan will attempt to process an identified Document. 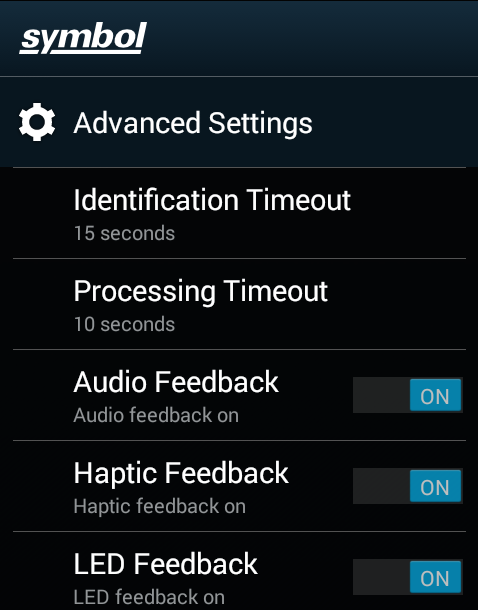 Audio Feedback - plays a beep sound to indicate processing success. Haptic Feedback - vibrates to indicate processing success. LED Feedback - flashes the LED light to indicate processing success. Debug Mode - if enabled, allows a session to write form-capture data to device storage. Auto Capture - controls whether a document is automatically captured once identified or waits for the a user action. Image Correction - enables image correction for parsing targets that are slightly curved or crumpled. Capture Sensitivity - for Auto Capture, sets a stillness threshold for the scanning device from 1-10 (most still).